Bu çalışma Sb-katkısının SnO2 nin kristal, yüzeysel, optik ve elektriksel özelliklerine etkisini sunmaktadır. Sb katkılı numuneler ısıl püskürtme yöntemi ile cam altlıklar üzerine büyütmüştür. 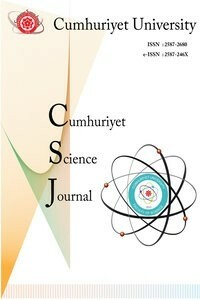 Piramit ve çok yüzlü şekilli tetragonal Sb katkılı SnO2 taneleri XRD ve SEM analizleri ile belirlenmiştir. Filmler için dejenere n-tipi iletkenlik özelliği elektriksel ve optiksel karakterizasyonlar ile belirlenmiştir. Özdirenç ve tabaka direnci değerleri ilk olarak ağırlıkça % 1.5 Sb içeriği ile azalmıştır ve sonra bu değerler daha fazla Sb içeriği ile artmıştır. Fakat taşıyıcı konsantrasyonu ağırlıkça % 2.5 Sb içeriği ile artmıştır, sonra ise % 3.5 Sb içeriği ile azalmaya başlamıştır. Numunelerin optik bant aralığı Sb katkılama ile azalma eğilimindedir. Bu çalışmada elde edilen sonuçlardan Sb katkılı kalay oksit ince filmlerin optoelektronik uygulamalarda kullanılabileceği söylenebilir. This work presents that the impact of Sb-additive on the crystalline, morphological, optical, and electrical features of SnO2. Sb-incorporated samples were fabricated on glass substrates with spray pyrolysis. Pyramidal and polyhedron shaped tetragonal Sb-introduced SnO2 grains were identified with XRD and SEM analysis. The degenerate n-type character for films was determined by electrical and optical characterizations. The resistivity and sheet resistance values initially decreased with Sb-content until 1.5 wt. %, then they increased with further Sb-level. However, carrier concentration increased with 2.5 wt. % Sb-contribution, then it started to goes down with 3.5 wt. %. The optical band-gap values of samples had a decreasing tendency with Sb-doping. From the results obtained in the present study, it is said that Sb-incorporated tin oxide films can be utilized in optoelectronic implements.
.	Babu B., Kadam A.N., Ravikumar R.V.S.S.N., Byon C., Enhanced visible light photocatalytic activity of Cu-doped SnO2 quantum dots by solution combustion synthesis, J. Alloy. Comp. 703 (2017) 330-336.
.	Turgut G., Effect of Ta doping on the characteristic features of spray-coated SnO2, Thin Solid Films 594 (2015) 56-66.
.	Bhatnagar M., Dhall S., Kaushik V., Kaushal A., Mehta B.R., Improved selectivity of SnO2:C alloy nanoparticles towards H2 and ethanol reducing gases; role of SnO2:C electronic interaction, Sensors and Actuators B 246 (2017) 336-343.
.	Chandra S., George G., Ravichandran K., Thirumurugan K., Influence of simultaneous cationic (Mn) and anionic (F) doping on the magnetic and certain other properties of SnO2 thin films, Surfaces and Interfaces 7 (2017) 39-46.
.	Lian X., Li Y., Tong X., Zou Y., Liu X., An D., Wang Q., Synthesis of Ce-doped SnO2 nanoparticles and their acetone gas sensing properties, App. Surf. Sci. 407 (2017) 447-455.
.	Gao F., Li Y., Zhao Y., Wan W., Du G., Ren X., Zhao H., Facile synthesis of flower-like hierarchical architecture of SnO2 nanoarrays, J. Alloy. Comp. 703 (2017) 354-360.
.	Turgut G., Keskenler E.F., Aydın S., Sönmez E., Doğan S., Düzgün B., Ertuğrul M., Effect of Nb doping on structural, electrical and optical properties of spray deposited SnO2 thin films, Superlattices and Microstructures 56 (2013) 107-116.
.	Elangovan E., Ramamurthi K., A study on low cost-high conducting fluorine and antimony-doped tin oxide thin films, App. Surf. Sci. 249 (2005) 183-196. .	Ynineb F., Attaf N., Aida M.S., Bougdira J., Bouznit Y., Rinnert H., Morphological and optoelectrical study of ZnO:In/p-Si heterojunction prepared by ultrasonic spray pyrolysis, Thin Solid Films 628 (2017) 36-42.
.	Menaka S. M., Umadevi G., Manickam M., Effect of copper concentration on the physical properties of copper doped NiO thin films deposited by spray pyrolysis, Material Chemistry and Physics 191 (2017) 181-187.
.	Babar A.R., Shinde S.S., Moholkar A.V., Bhosale C.H., Kim J.H., Rajpure K.Y., Physical properties of sprayed antimony doped tin oxide thin films: The role of thickness, Journal of Semiconductors 32 (2011) 8p.
.	Babar A.R., Shinde S.S., Moholkar A.V., Bhosale C.H., Kim J.H., Rajpure K.Y., Sensing properties of sprayed antimony doped tin oxide thin films: Solution molarity, J. Alloy. Comp. 509 (2011) 3108-3115.
.	Babar A.R., Shinde S.S., Moholkar A.V., Bhosale C.H., Kim J.H., Rajpure K.Y., Structural and optoelectronic properties of antimony incorporated tin oxide thin films, J. Alloy. Compd. 505 (2010) 416-422.
.	Bisht H., Eun H.T., Mehrtens A., Aegerter M.A., Comparison of spray pyrolyzed FTO, ATO and ITO coatings for flat and bent glass substrates, Thin Solid Films 351 (1999) 109-114.
.	Elangovan E., Ramamurthi K., Effect of substrate temperature on electrical and optical properties of spray deposited SnO2:Sb Thin Films, J. Opt. Adv. Mater. 5 (2003) 415-420.
.	Elangovan E., Ramamurthi K., Studies on optical properties of polycrystalline SnO2:Sb thin films prepared using SnCl2 precursor, Cryst. Res. Cryst. Tech. 38 (2003) 779-784.
.	Elangovan E., Ramesh K., Ramamurthi K., Studies on the structural and electrical properties of spray deposited SnO2:Sb thin films as a function if substrate temperature, Solid State Commun. 130 (2004) 523-527.
.	Elangovan E., Shivashankar S.A., Ramamurthi K., Studies on structural on structural and electrical properties of sprayed SnO2:Sb films, J. Crys. Growth 276 (2005) 215-221.
.	Ravichandran K., Philominathan P., Fabrication of antimony doped tin oxide (ATO) films by an inexpensive, simplified spray technique using perfume atomizer, Mater. Lett. 62 (2008) 2980-298.
.	Ravichandran K., Phiominathan P., Analysis of critical doping level of sprayed antimony doped tin oxide films, J. Mater. Sci: Mater. in Elec. 22 (2011) 158-161.
.	Thangaraju B., Structural and electrical studies on highly conducting spray deposited fluorine and antimony doped SnO2 thin films from SnCl2 precursor, Thin Solid Films 402 (2002) 71-78.
.	Turgut G., Duman S., Özçelik F.S., Sonmez E., Gurbulak B., An investigation of Zn/ZnO:Al/p-Si/Al heterojunction diode by sol-gel spin coating technique, J. Sol-Gel Sci. Technol. 71 (2014) 589-596.
.	Smith A., Laurent J. M., Smith D. S., Bonnet J. P., Clemente R. R., Relation between solution chemistry and morphology of SnO2-based thin films deposited by a pyrosol process, Thin Solid Films 266 (1995) 20-30.
.	Turgut G. and Keskenler E.F., The characteristic investigation of spray coated W incorporated in oxide thin films, Moscow University Physics Bulletin 71 (2016) 105-113.
.	Kazmerski L.L., Polycrystalline and Amorphous Thin Films and Devices.New York: Academic Press, 1980.
.	Turgut G. and, Sönmez E., Synthesis and characterization of Mo doped SnO2 thin films with spray pyrolysis, Superlattices and Microstructures 69 (2014) 175-186.
.	Whitney J.E. and Davidson N., A Spectrophotometric Investigation of the Interaction between Antimony (III) and (V)1a,b,c in Hydrochloric Acid Solutions, J. American Chem. Soc. 71 (1949) 3809-3816.
.	Jung D. W. and Park D. W., Synthesis of nano-sized antimony-doped tin oxide (ATO) particles using a DC arc plasma jet, App. Surf. Sci. 255 (2009) 5409-5413.